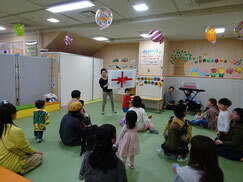 We had the Birthday party for the children born in April at てくるん.Many people joined it.We had a great time. 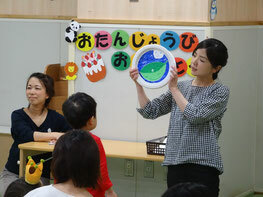 My partner read The Very Hungry Caterpiller story using paper plates with pictures drawn on them. Children looked and listened well.We sang and danced together.We also danced with colorful scarves to the music.And then children ripped paper to reveal a big craft cake present that I made.They were so excited.Finally we gave birthday cards to each child that had been made using their hand prints and pictures. I was happy that I could celebrate with them.Thank you.